this event is a joke !! thousands of bugs and problems and give us this senseless event. I prefer nothing to this. Why do you like it, Amiga? Many times my team is bruised, heavy damaged....I don't like to spend gold on healing. The horde or 1 minute gas refill we diserve as a weeken event. I am a solid mid-level player. All my survivors are level 12. I can complete some level 13 and 14 episode and challenge missions, but at least one of my team comes out bruised or even had a striggle. Healing times on them are 44 min to 1 hr 25 min. When grinding for the last few stars to get that 140 reward, I may run out of useful survivors before running out of gas. Half time to heal is useful to me at this point. There is nothing more agrevating than picking up 4 gas cans from a crate and realizing that your gas will be fully replenished in 41 minutes but your survivors won't be ready for 75 minutes. It's like 3 gas cans were wasted. So, for those who are low to mid-level, events like this are very beneficial. Let's face it, the challenge changes were geared to benefit high level players. They have to balance that out by offering events that benefit new players. If everything is done to benefit high level players, new players will get discouraged and find other games to play. In order to continue to develop the game, they have to attract and retain both new and old players so the revenue base grows. If the average freemium player drops $20 a month, it takes at least 200 players to pay one fresh out of college programmer. It takes a team of at least 5 seasoned programmers, 3 artists, and support staff plus overhead like servers, rent, electricity, etc to keep the game running. If 50,000 people play a game, only 3% regularly make purchases. That's about 1500 people paying $30,000 a month. $3,000 for overhead leaves $27,000 to pay at least 10 people (and that includes money to pay for bemefits). They have to attract more players so they can make money to hire more staff with more experience. They have to balance the game to attract new players and retain established ones. 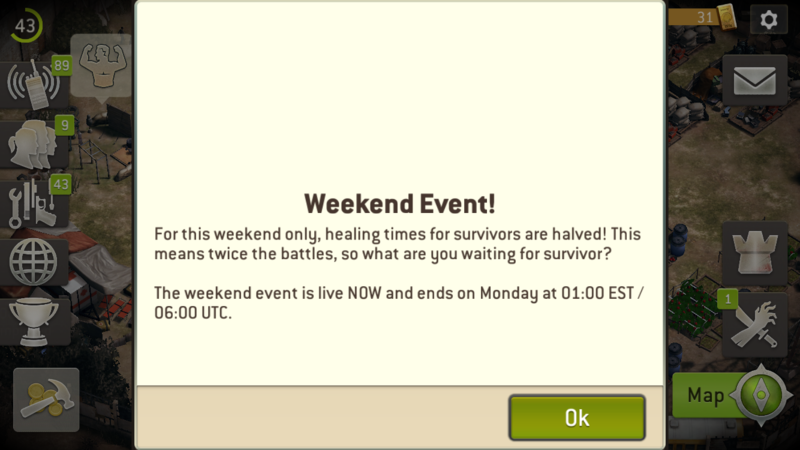 I am not sure I understand how reducing healing time means "twice the battles" as advertised by the in game pop up. For example, reducing has time to 5 minutes would seem to make twice as many battles possible given the current gas refill time. If choosing battles wisely and trying ones that would cause heavy injury last, my survivors would still be out of the hospital before I would lose any gas. Semantics aside, this is a good event to couple with people still raiding outposts. Like I say you had a huge chance and you failed again. This shows your utter unappreciation of the players who spend hours on your products and those that invest in you.